After a summer hiatus, the WIST giveaway is back--and this time to celebrate the end of summer, the lively Andrea of ZenithJade Creations is providing the goodies for the draw. Take a good look at the beauties above--all three are part of the giveaway. 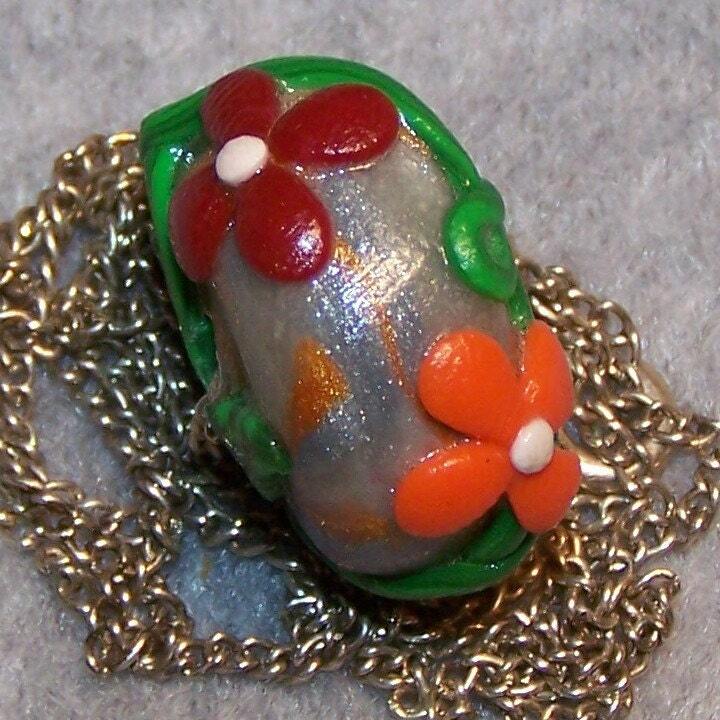 The first is a detailed polymer clay floral focal bead on a silver-plated chain. 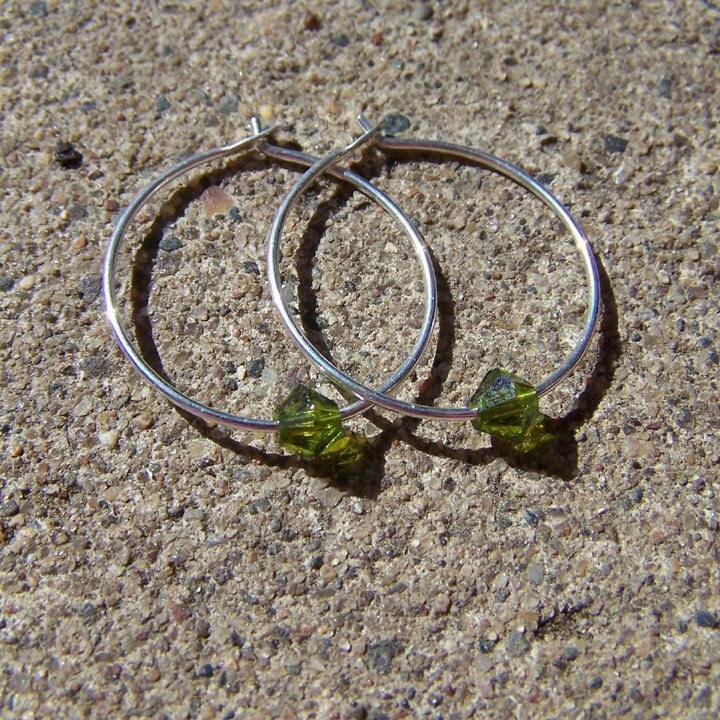 These beautiful hoops are approximately 3/4" (2cm) long and silver-toned with faceted Swarovski crystal bicones. The silver ring has layered brass components with a swarovski crystal accent and is approximately 3/4" (2cm) around. HOW TO ENTER: You have four entry opportunities here–make a separate comment for each entry. Enter only four times. If the winning entry does not contain contact information, an alternate winner will be chosen, so please leave your email! The giveaway is open to entries worldwide. Entry Option 1: Leave a comment telling us about your favorite ZenithJade Creations product. Entry Option 2: Twitter about this giveaway, then come back and leave a link to your twitter in the comments. Entry Option 3: Blog about this giveaway, then come back and leave a link to your post in the comments. Entry Option 4: Let others know about this giveaway on Facebook…and then come back to leave a link to your post in the comments. All three winners will be chosen from comments made by Tuesday, September 8, 2009 at noon CST. I’ll be using the random number generator to choose the winner later that evening! WIST giveaways run every other Tuesday, so please add our blog to your RSS Reader or bookmarks for more opportunities to win fantastic Wisconsin arts and crafts. For questions or comments, contact Julie at Bohtieque Design. I really like the Green Envy Adjustable Ring. all the pieces are so interesting but Happiness Necklace is my favorite! Thanks for the opportunity! great giveaway, something for everyone! I had trouble with my last comment- delete if this is a double post. My favorite is the lotus chain set. Very pretty! What a great giveaway! 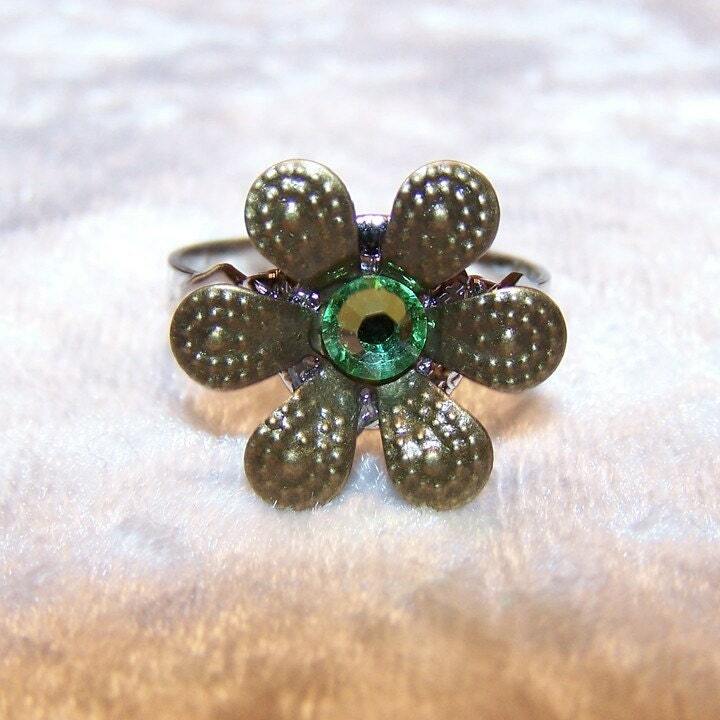 My favorite item is the Steampunk Brass Flower Adjustable Ring in Violet. It's beautiful! and looks like lots of fun to wear. Thanks for the opportunity, and letting me know about this great shop! My favorite is the Blossoming Spring Necklace! I really like the lucious purple dangle earrings! I really like the lotus chain jewelry. It's very pretty. My favourite item is the Harmony Necklace. I like the Beautiful Bahama Blue Dangle Earrings. The Spring Soul Blossom necklace is a piece that speaks to me...I love the colors and the form of it. What an unusual and gorgeous floral necklace! Tweet Tweet! :) Great stuff ZenithJade! My fave product is the MOTHER of PEARL & PEARLS necklace! I love Harmony Necklace ! My favourite items are they "Swarovski Hoops"- in any colour! They're simple and add a splash of colour to an outfit. i love the vintage floral ring in green and white! I love the Harmony Necklace. :) Thanks! The white dew bangle and earring set is gorgeous. Thanks for the wonderful giveaway. I like the Green Smoke Adjustable Ring. WIST Yahoo! Group - stay connected! © Copyright 2009 | Wisconsin Street Team - "The Moo Crew"